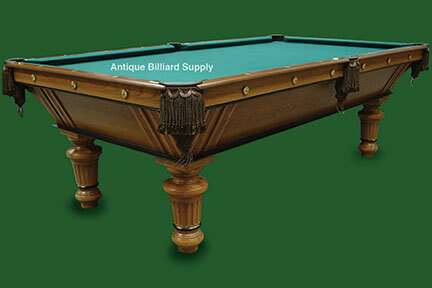 #1-09 This very attractive Brunswick pool table design was introduced in the 1890s as a revision of earlier antique pool table designs. It offered unusual durability and playing qualities. Quarter sawed oak construction. Eight-foot size, three-piece Vermont slate playing surface. Ready for delivery.